After an inspiring week of music at the All Ireland Fleadh this past month, I had the chance to spend a day at the amazing Irish Traditional Music Archive on Merrion Square in Dublin. There, I dove into the ITMA’s incredible collection of field recordings from Newfoundland made in the 1970s by Aidan O’Hara. The ITMA recently launched a digital exhibition of O’Hara’s Newfoundland material on its website that I highly recommend checking out. This month’s song is one that you can listen to directly from their website—easier (though less fun) than a trip to Dublin! I was delighted to come upon O’Hara’s recording of Newfoundlander Frankie Nash giving a spirited rendition of this comic song! 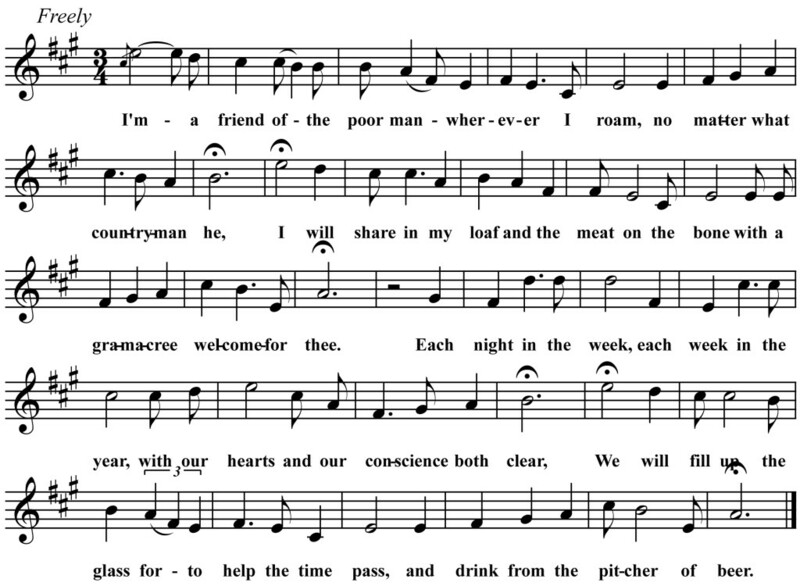 I encountered it first several years ago as performed by Crandon, Wisconsin traditional singer Robert Walker who was recorded by Sidney Robertson Cowell in 1937. Walker’s version (available here) is nice but to me it is Nash really brings “Riley” to life. 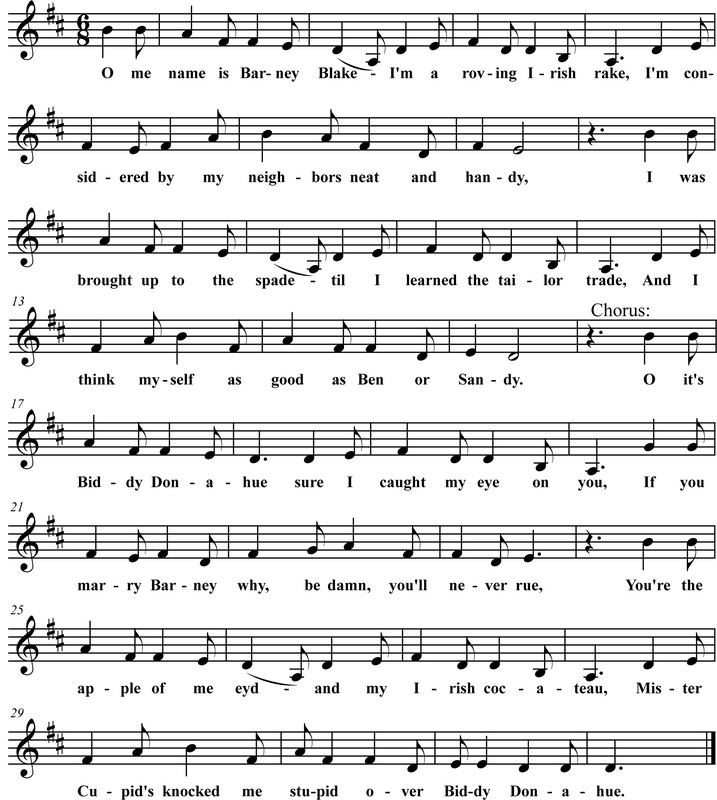 Digging around online, I was also happy to discover that the New York Public Library has unearthed and digitized an 1892 song sheet version titled “I Handed it Over to Riley” which you can also access online. In Newfoundland, the song is attributed to local songsmith Johnny Burke. NYPL’s song sheet, and the style of the song itself, would seem to suggest that it most likely originated on the stage (the composers are listed as Albert Hall and Felix McGlennon) and was then, like many stage songs, adapted into tradition by others. Interestingly, the Newfoundland, Wisconsin and song sheet versions of this song all have rather distinct melodies from one another. 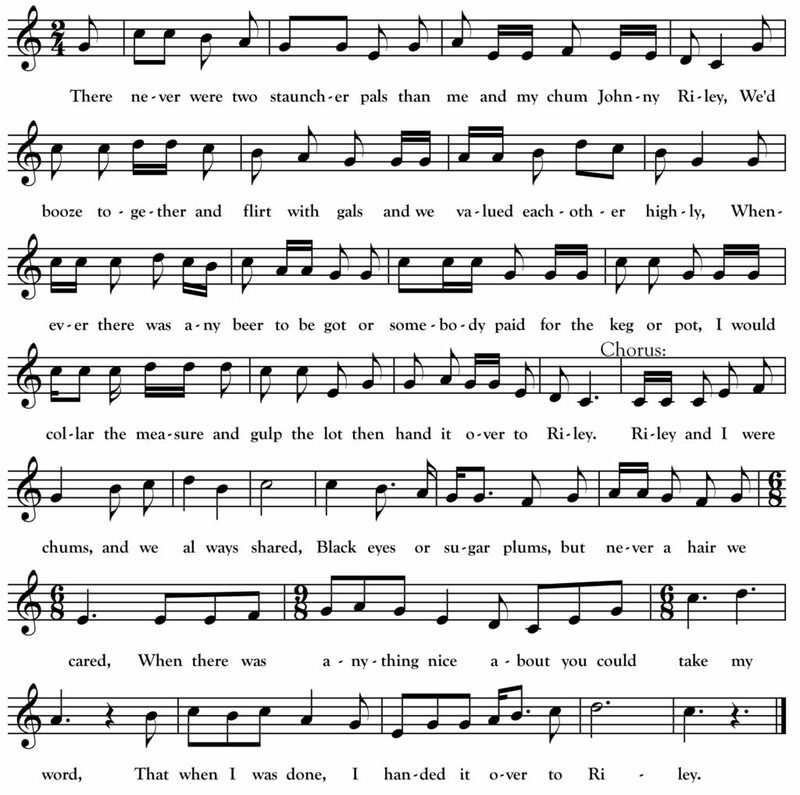 The above transcription is based on the Newfoundland melody though I drew on all three versions to fill out the text. I will share in my loaf and the meat on the bone, with a gra machree welcome for thee. We will fill up the glass for to help the time pass, and drink from the pitcher of beer. The old folks at the table with plenty galore will welcome you in with delight. They will hand you their glass for to help the time pass, and drink from the pitcher of beer. For to fret and to worry, to weep and to pray, when relief we can easi-lye find. Tell a story or two, let it be old or new, and drink from the pitcher [spoken:] of beer. As with “Barney Blake” (See Northwoods Songs, Oct. 2014), the Grand Marais mentioned is almost certainly Grand Marais, Michigan. And, like “Barney Blake,” “The Pitcher of Beer” is a song that began on the Irish music hall stage and then entered the unaccompanied tradition in the northwoods lumbercamps. 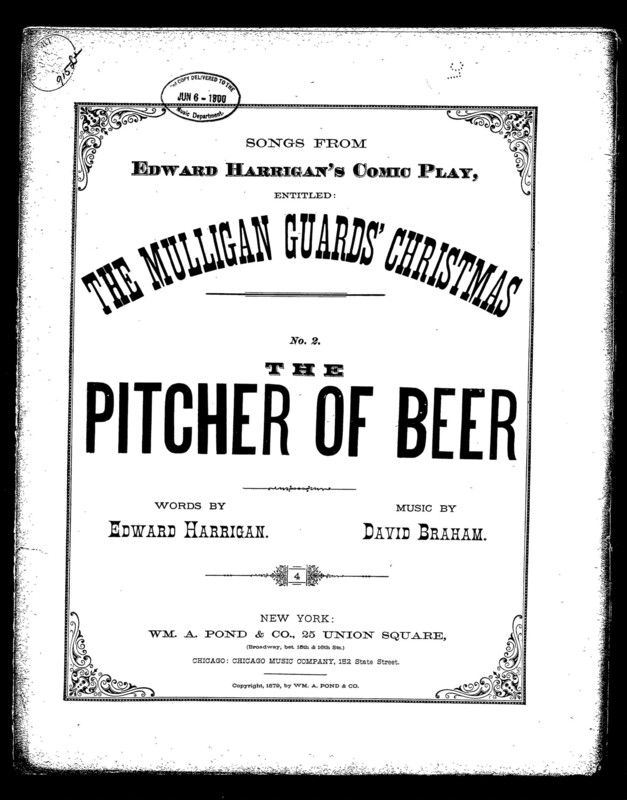 The original was written by Edward Harrigan, one of the most renowned Irish songwriters of the 19th century for the 1880 play The Mulligan Guard’s Christmas… so there is a seasonal connection. The Library of Congress has a copy of a sheet music version printed the year of the play. It’s interesting to compare the original with the way the song was sung by Gallagher. And I think myself as good as Ben or Sandy. For my heart it melted like a lump of butter. And for dancing, boys, she has a lovely carriage. And she’ll marry none [hold on “none”] but Barney Blake the sailor. This is another song I transcribed from a reel-to-reel recording made in Beaver Island, Michigan while I was at the American Folklife Center in Washington, DC this summer. Singer Dominick Gallagher (1867-1954) sang this for collector Ivan Walton in 1940. Gallagher: “I learned that in the lumber woods about 45 or 50 years ago from a Canadian Scotsman. The song itself seems to have its origins in the Irish music halls of the 1870s where I have found evidence of it being performed by (and perhaps written by) a song and dance duo by the names of Devlin and Tracy that were active in Boston and New York in that era. It was very common for singers to pick up Irish music hall songs and sing them unaccompanied in lumber camps. In fact, another version of Barney Blake was collected from Ottawa Valley singer O.J. Abbott. First, I misidentified the singer as John W. Green instead of Gallagher who actually sang the song for Walton. Also, I was a bit over-eager to claim a Grand Marais, Minnesota connection for this song based on this mention of “Grand Marais on Lake Superior shores.” After I sent in my column to be published in the IMDA October newsletter, a friend reminded me that there is another Grand Marais on the southeastern shore of Lake Superior in Michigan’s Upper Peninsula. It is much more likely that Gallagher did his logging in the locality of the Michigan Grand Marais, not on Minnesota’s north shore.